An incredible piece of Android hardware, that falls just short of smartphone perfection. With the Android smartphone market getting more crowded by the month, it is now time for Google to stand up and reveal its vision for the future of its mobile operating system. The second-generation of its Pixel smartphone family was revealed late last year, with Google once again revealing top-end hardware alongside the latest build of Android. But can the Google Pixel 2 XL live up to the success of the critically-acclaimed first-generation device? We put it to the test to find out more. Google has set out the Pixel 2 XL to be a high-end, premium device, and this is reflected in the smooth and stylish design. The Pixel 2 XL takes many of its design cues from the original device, showing that Google believes in the old adage of "if it ain't broke, don't fix it". This means a smooth metal back of the device, a welcome change from the glass panels seen in several recent flagships, making the device easy to hold. At just 175g, the Pixel 2 XL is light and easy to carry out, slipping easily into a suit jacket or trouser pocket - thanks also to its slimline build which is just 7.9mm across. There's no 3.5mm headphone jack, as Google looks to conform to the market trend, with the fingerprint scanner keeping on the rear of the device in order to maximise screen size. This screen dominates that front of the device, where the 6.0in display stretches nearly the whole way across the face of the phone. At 1440x2880px, there's no 4K display, which is a shame, but most of the time this actually isn't too much of an issue, as the screen is incredibly detailed. The new live wallpapers, unveiled by Google with the Pixel 2 family of devices, are a beautiful, subtle touch that show off the sheer amount of detail within the display. It's no secret that Google's latest handsets have suffered some issues when it comes to their displays, but we didn't come across any problems when using our review item. As mentioned above, the display isn't as pixel-packed as some other leading devices out today, but overall, it provides a great visual experience. Google does not normally skimp on the hardware for its flagship devices, and the Pixel 2 XL is no exception. Powering the new device is Qualcomm's top-of-the-range Snapdragon 835 processor, clocked at 2.35GHz and backed up by 4GB of RAM. This means speedy start-ups, quick downloads, and the ability to have multiple power-hungry apps running all at once. Inside, there's a choice between 64 or 128GB internal storage, and unlike several other recent flagship Android smartphones, the Google Pixel 2 XL does sport microSD support, allowing you more space for your photos, videos and apps. All this is backed up by a huge 3,520mAh battery that is a slight improvement over the first-generation Pixel XL. Our tests found that the battery could withstand a full working day's usage, even when put to the test by multiple heavy-duty apps and services - meaning you should hopefully never be caught out. When it comes to usability, the Google Pixel 2 XL is one of the most welcoming and friendly devices we've ever seen. Starting up the device and getting set up for the first time is quick and simple, especially if you're an existing Android user, as Google looks to make using your new phone a remarkably straightforward process. Navigating through the menus and screens is done with just a swipe, and locking and unlocking the device with a fingerprint scan is incredibly fast. As usual, Google has imbued its own-brand devices with the very latest build of Android, meaning that although it ships with Android 8.0 Oreo out of the box, this can be quickly updated to the newest version. This means that all of Android's top features are present, including the always-useful Google Assistant, which is rapidly proving itself to be a worthy adversary to Apple's Siri. Google's suite of workplace apps is also of course included, with the likes of Google Drive making this an ideal business companion, giving you the ability to share and update files on your phone, no matter where you are. Call quality was crisp and clear, even in crowded locations, meaning you should have no trouble staying in touch, and Google's own Duo software is included for those that prefer video-calling. As mentioned above, battery life was excellent as expected, with recharging done via the included USB-C cable, and is a remarkably speedy process thanks to the imbued quick charging system. 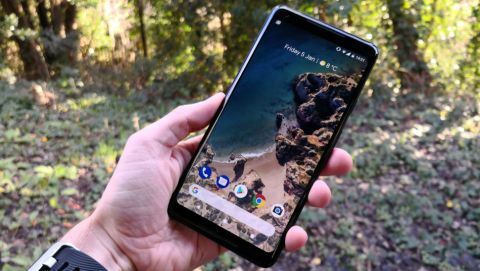 Overall, the Google Pixel 2 XL proved to be an incredibly worthwhile addition to our daily work routine, whilst also holding up very well as a personal and social device. Combining powerful and reliable hardware with the very latest and best version of Android makes the Pixel 2 XL a delight to use. Add in the ideal suite of workplace apps and services, an elegant design, and all-day battery life, and it really is a device that is hard to top. It may be expensive (currently selling SIM-free in the UK from £799), but if you're in the market for a truly high-end Android smartphone that is a joy to use, the Google Pixel 2 XL may be just what you're looking for.